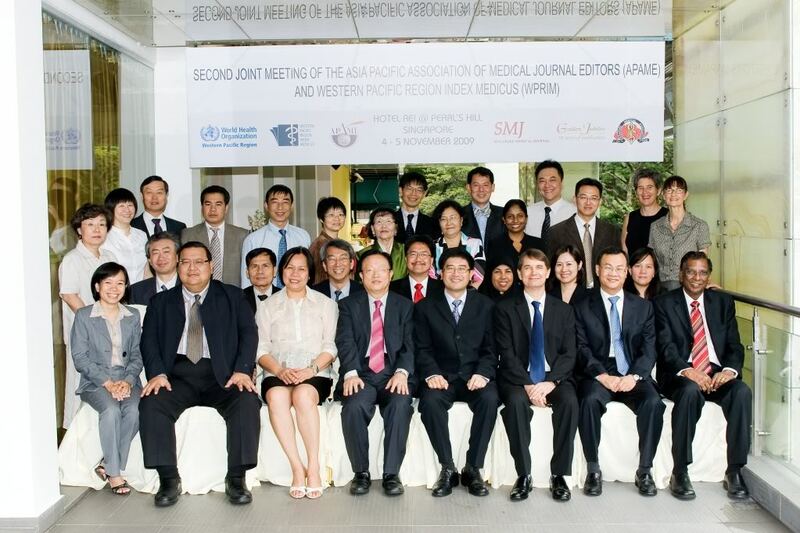 A Second Joint Meeting of the Asia Pacific Association of Medical Journal Editors (APAME) and the Western Pacific Region Index Medicus (WPRIM) was held in Singapore from 4 to 5 November 2009. The first day of the meeting focused on the status of the WPRIM project, discussions on planned key training activities, funding and the new WPRIM database developed by the Institute of Medical Information Chinese Academy of Medical Sciences (IMICAMS). The Regional Journal Selection Committee also evaluated and approved the candidate journals endorsed by the National Journal Selection Committees for inclusion in WPRIM. The second day, which was devoted to APAME, included reports of previous training activities and discussions of key activities such as website development. The Singapore Declaration on Equitable Access to Health Information in the Western Pacific Region was also reviewed and finalized. The declaration was formally launched on 6 November 2009 during the International Forum for Medical Journal Editors, which was held in conjunction with the Singapore Medical Journal Golden Jubilee Conference at the National Cancer Centre Singapore. (2) to review the progress of APAME activities including its website. Significant outcomes of the meeting included the launching of the new database developed by IMICAMS in May 2009 in Beijing, China; approval of 108 new journals for WPRIM; and adoption of the Singapore Declaration on Equitable Access to Health Information in the Western Pacific Region. Several recommendations were proposed following the presentations and discussions of the meeting agenda.